I seriously don’t know where this year is going , September went by extremely fast and now October is upon us and I still feel like we are at the beginning of the year! I love fall but as always (and I think it’s the case for everyone), September is an extremely busy and exhausting month. I didn’t have a lot of time to read and when I did, I either took naps or watch TV shows that were less demanding to my brain… So that’s why there isn’t a lot of books in the Books Read section but oh well, naps are important. I didn’t have the worst reading month ever but most of the things I read didn’t really impress me. The Real Town Murders was the only book that really stood out to me this month. Station Eleven and All Systems Red were nice enough but they didn’t managed to meet my expectations. I already managed to forgot the names of the main characters so that tells you something. 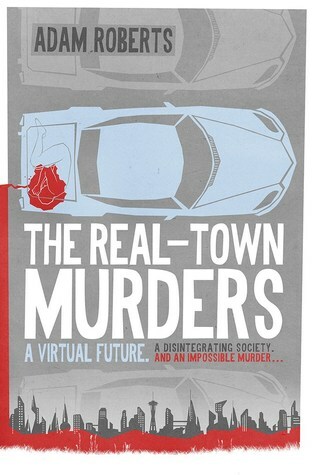 Without a doubt The Real-Town Murders by Adam Roberts, a fun, innovative and clever science fiction thriller that I devoured in a few sittings. I don’t know about you but during fall I love to read spookier things and I have a ton of books I really want to get to this October! I started IT by Stephen King a few weeks ago and I would like to finish it this month. So far I like it even if I thought it was going to be much more scary than it actually is. However, since I have only read the first part yet, my opinion on the level of “scariness” may change. I’m also 10% in Null States by Malka Older which is the second book in the Infomocracy series and so far so good. As I said, I am currently in the mood for scarier/spooky books this month and since I am considering a lot of options, I will just list the ones I really want to get to soon. If you see a particular title that looks interesting to you or that you would like me to read, please say so, it would help me narrowing down the list! Aww I’m sorry you didn’t liked more of these books! Let’s hope October will be better! I need to read Skullsworn too! Drop everything and read The Last Days of Jack Sparks! Or Beyond Redemption, because that sounds awesome!!! (I haven’t read it yet, so can’t say for certain).